Emerging from anonymity in the 1920s as a private enclave for Hollywood legends such as Greta Garbo and Clark Gable, La Quinta was quickly recognized for its picture-perfect setting, ideal golf terrain and easy access to desert recreation. Incorporated in 1982 and now home to 43,778 residents, the “Gem of the Desert” is, among other things, a golfer’s paradise. Acknowledged in 2003 as the “Best Place to Live for Golf” by the Robb Report, La Quinta has more than 20 golf courses, including the famous PGA West and the acclaimed Arnold Palmer Classic Course at SilverRock Resort. 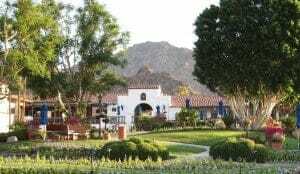 It is also home to the Coachella Valley’s largest resort, the historic La Quinta Resort & Club. Culture abounds here. La Quinta Museum features exhibits of natural and cultural history of the region, while the La Quinta Arts Festival, La Quinta Playhouse and La Quinta Arts Foundation keep art and performance in the public eye throughout the year. Naturally, the scenic desert landscape is a draw for both locals and visitors from around the world who follow nearby walking and hiking trails and bike routes with cameras and watercolors tucked into their day packs along with sunglasses and water bottles. The Bear Creek Trail and the Santa Rosa and San Jacinto mountains offer limitless beauty within minutes of home, office or hotel. When it is completed in 2010, the 92,000-square foot Eisenhower George and Julia Argyros Health Center will serve the eastern Coachella Valley with a full array of health services. La Quinta is also a major shopping hub, from boutiques to big-box stores. The Highway 111 corridor and Old Town La Quinta offer a tantalizing selection of shopping, dining and personal services. Want to search for homes or learn more about La Quinta Real Estate? Check out the links below.